Alampur, known as Southern Kashi, stands on the left bank of the Tungabhadra River, in Mahbubnagar district in the state of Telangana. It is about 90 km from Mahabubnagar, 27 km From Kurnool and 200 km from Hyderabad. Alampur is few kilometers away the sacred rivers Tungabhadra and Krishna which Hindus hold sacred. It also acting as the western Gateway of Srisailam, the famous Shaivite (Shaivism) pilgrim centre. The origin of the name Alampur is unknown. Its inscriptions call it Hatampura and Alampuram, while local traditions name it Hemalapuram. The name Alampur is said to have originated from that of a local diety, Ellamma. The main Goddess of the place, Jogulamba, is one of the eighteeen Saktis of India. There are nine temples here which date back to the 7th century. Built by the Badami Chalukyas rulers, they were dedicated to the worship of Lord Shiva. But each of them is named after Brahma, the Taraka Braham, the Svarga Brahma, the Padma Brahma, the Bala Brahma, the Garuda Brahma, the Kumara Brahma, the Arka Brahma, the Vira Brahma and Visva Brahma. There are temples of Narasimha and Surynarayana in the vicinity. Known as the Nava Brahma Temples, the temples all stand within an enclosed area, on the banks of the Tungabhadra river. On either side of the main entrance are temples of Goddess Kamakshi and Goddess Ekamresvari. 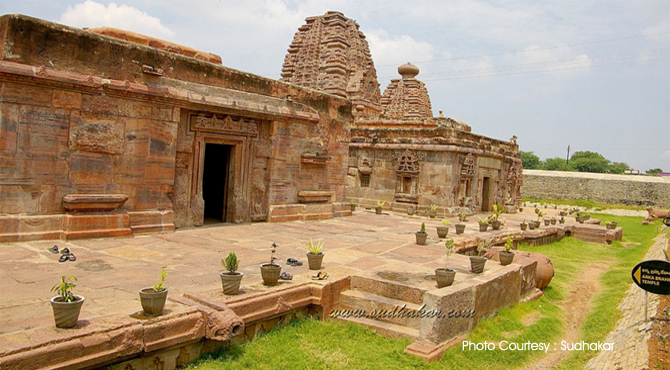 The architecture of Alampur temple is not like Dravadian style, it is more of influenced by the Western and Northern Indian styles of architecture. Of the nine temples here, Taraka Brahma is the oldest. A 6th-7th century inscriptions present here. Partly in ruins, the remains show Pallava influence rather than the ratha and sikhara arrangement which makes this shrine unique among other temples. Standing on a raised platform, it contains a square sanctum, Antarala and a small portico. There is no image in the sanctum and there is an image of Paralambampadalakshmi in Antarala. The top part of the temple contains Kudu, Sala and Panjaran, which are influenced majorly on Gopuram style. Artistically the finest among the temples in Alampur, it is an excellent example of Chalukyan architecture and sculpture. An inscription mentions that the temple was built during 681-696 AD by Lokaditya Ela Arasa in honour of the queen of Vinayaditya. This temple is the most elaborately ornamented temple with an imposing tower (Rekhanagara vimana). Its porch has six pillars, two pairs in the front and one on each side. The shrine contains reliefs of Lord Nataraja. In the sanctum there is a Linga. There are some reliefs on the lintel of a mandapa and in niches on the walls. The Padma Brahma is partly in ruins, and it has a polished stone sculpture of Shivalinga. One can see one'e reflection in it. This temple has the biggest sanctum in Alampur. According to an inscription here, Bala Brahma temple's outer walls and a mandapa dates back to 7th century. It is the main shrine of worship where Shivaratri is celebrated. From the numbers of centuries, this temple has been worshipped and this temple is now the main one for worship. It consists of Bala Brahmesvara's idol. According to the locals, whatever amount of water, you will use for the Abhisheka (ritual to worship God) it goes within, but not even a one drop of water come outside. It is situated south of the Bala Brahma. The temple gets its name from an image on the lintel which depicts Garuda carrying Lord Vishnu. It is situated north of Bala Brahma. It is the second oldest in Alampur. It's pillars are fully endowed with sculptures on the façade which is a delight. On the lintel of a mandapa there are seven identical human faces set in a row. The Seven Mothers appear togethere in a single stone in the mandapa. Three temples stand north of Kumara Brahma, Of these it is most artistic temple. Vishwa Brahma temple having sculptural scenes from the epics. Among its superb sculptures are scriptural stories, scence of flower, bird and animal, and also some amatory couples. The Arka Brahma and the Vira Braham both are in ruins, but offer a peek at the glory of the past. There are other temples within the enclosed area. Situated near to Nava Brahma, Suryanarayana temple dates back to 9th century. it has three sanctum. This temple has bas reliefs representing the incarnations of Lord Vishnu. And Narasimha temple with inscriptions belongs to Sri Krishna Devaraya (Vijayanagar Empire). It also has three sanctum. About 1.6 km south of Alampur is Papanasam, another pilgrim center where there is a cluster of over twenty temples. The Papanasar temple is the main temple and around it stand the smaller temples. It is first among the NavaKailayams where the Navagraha known for this temple is Surya (The Sun). Alampur also has a Government Museum. It is situated behind the Kumara Brahma temple at the Nav Brahma site. This museum has a large, varied collection of images removed from the Nava Brahma temples and other monuments.